Two days after trading for Troy Tulowitzki, the Blue Jays have added David Price in a trade with the Tigers as Toronto goes for broke to snap its two-decade-long postseason-less streak. Less than 48 hours after shocking the baseball world by trading for Troy Tulowitzki, the Blue Jays have added another major piece in an attempt to end the majors' longest postseason drought, sending three lefthanded pitching prospects to the Tigers for former AL Cy Young winner David Price. The 29-year-old lefty, who will be a free agent after this season, gives the Jays' underperforming rotation a much-needed ace, while the trio of southpaws—the most notable of whom is Daniel Norris—helps replenish a Detroit farm system that was repeatedly plundered in the service of maintaining the team's four-year hold on the AL Central. The Tigers acquired Price from the Rays last July 31 in a three-way deal that sent centerfielder Austin Jackson to Seattle and both lefty Drew Smyly and minor-league shortstop Willy Adames to Tampa Bay. The move was supposed to help offset the struggles of Justin Verlander, the winter trade of Doug Fister and the impending loss of free agent Max Scherzer, but after winning the Central, the Tigers were swept by the Orioles in the Division Series. With the rest of this year's rotation besides Price in tatters, the team has gone 38–50—tied with Oakland for the AL's second-worst record in that span—since opening the year at 11–2. At 51–51, the Blue Jays are just 1 1/2 games better than the Tigers in terms of won-loss record, but their +100 run differential is the league's best, suggesting they're capable of significantly better play, while Detroit's -34 ranks 10th. Toronto is just two games out of the second Wild Card spot, one of four teams within 2 1/2 games, and while the Jays are seven games back in the AL East, they have 13 head-to-head matches left against the Yankees (who have roughed up Price for a 7.59 ERA in 32 innings over the past season and a half). The FanGraphs Playoff Odds, which take into account those run differentials as well as schedules and player projections, give them a 33.6% chance at reaching the postseason, compared to 9.1% for the Tigers. For the Blue Jays, who haven't made the playoffs since winning back-to-back World Series in 1992–93, there's a sense of urgency to break that streak, particularly with team president/CEO Paul Beeston set to retire after this season and general manager Alex Anthopoulos, who's been on the job since October 2009, without a contract for next year. Early Tuesday morning, the team dealt Jose Reyes and a trio of righthanded pitching prospects (Miguel Castro, Jeff Hoffman and Jesus Tinoco) for Tulowitzki and reliever LaTroy Hawkins. The move, which began paying dividends immediately as Tulo homered and doubled in his Toronto debut, upgraded the league's most potent offense (5.27 runs per game) as well as its defense and bullpen. Left un-addressed, however, was a rotation that has been reeling since the March loss of Marcus Stroman to a torn ACL. The unit ranks 12th in the league in both ERA (4.34) and quality-start rate (46%). Aaron Sanchez has been shifted to the bullpen after returning from a seven-week absence due to a lat strain, and Mark Buehrle and Marco Estrada are the only starters preventing runs at a better-than-average clip, though R.A. Dickey has allowed just five runs in 29 1/3 innings over his last four starts, lowering his ERA to 4.27. Lees happily, Drew Hutchison has been rocked for a 5.42 ERA. Price is a major upgrade over those back-end options, and so far this year, he has pitched up to his own high standards. His 2.53 ERA ranks fifth in the league and represents a career low, a hair better than the 2.56 mark from his 2012 Cy Young-winning season. Meanwhile, he's striking out 8.5 per nine and walking 1.8 en route to a 3.00 FIP; the last of those marks is ninth in the league, and his 3.4 WAR is sixth. He's making $19.75 million this year, his final one before free agency, and to beat out the other teams who showed interest—the Dodgers, Yankees, Astros and Giants—the Jays agreed to take on all $7.1 million of his remaining salary in addition to surrendering the trio of prospects. The most widely known of those is Norris, a 22-year-old second-round pick from 2011 out of a Tennessee high school who came into the year ranked 18th on Baseball America's Top 100 Prospects list and gained notoriety via an ESPN profile of his reclusive lifestyle, which includes living out of a 1978 Westfalia camper van by choice. 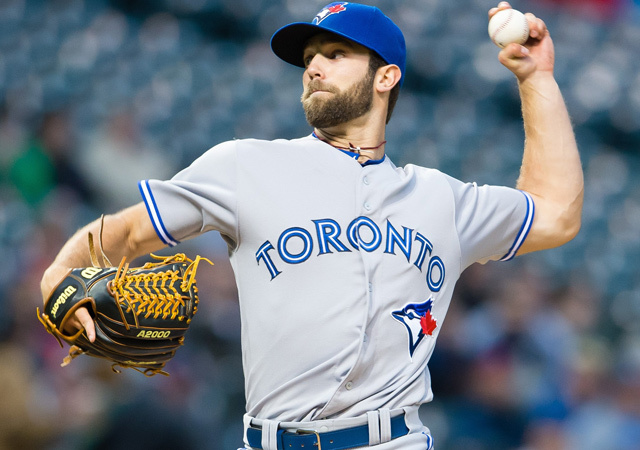 After making one start and four relief appearances for the Jays last year, he made five starts for the big club in April, but control problems led to his being sent back to Triple A Buffalo, and his performance there has been rocky as well: a 4.27 ERA with 4.1 walks and 7.7 strikeouts per nine in 90 2/3 innings. Even so, prospect hounds are still sold on his raw stuff, which features a 92–95 mph fastball, a plus curveball and a potentially plus slider as well as a clean, repeatable delivery. He recently cracked all of the major midseason prospect lists, peaking at No. 9 on that of Baseball Prospectus. The Tigers plan to start him on Sunday. The other two prospects in the deal are 24-year-old Matt Boyd and 21-year-old Jairo Labourt. A sixth-round 2013 pick who helped Oregon State win the College World Series that year, Boyd tore up the Eastern League with a 1.10 ERA across 12 starts and has fared well at Buffalo (2.79 ERA in six starts) but was hammered for 11 runs and five homers in 6 2/3 over two spot starts for the Blue Jays. For the season in the minors, he has a 1.68 ERA with 8.5 strikeouts and 1.8 walks per nine in 112 2/3 innings. Via FanGraphs' Kiley McDaniel, Boyd went from a situational reliever type to a starter after raising his arm slot and smoothing his delivery. In his scouting report from the spring, McDaniel wrote, "He sits 88–92 and hits 94 mph with a solid average changeup, a fringy curveball and a below average slider. He has good feel for his off-speed stuff and his breaking pitches will flash average at times, but fastball command and a consistent breaking pitch is what’s holding him back." BA's Ben Badler noted that Boyd's stock had risen this year, with his fastball reaching 95 and his stuff finding the zone more consistently, and called him a back-end starter or relief candidate. He'll head to the Tigers' Triple A Toledo affiliate. As for Labourt, he's much further from the majors. Signed out of the Dominican Republic in 2011, he's spent this season with Class A Dunedin, where his numbers resemble those of Norris: 4.59 ERA, 4.9 walks and 7.8 strikeouts per nine. He's 6'4", 205 pounds, having shed the weight that led McDaniel to call him "chubby" in his spring evaluation. His fastball sits 91–94 and can touch 95, while his slider is above average and his changeup average, marking him as a potential third or fourth starter if his command and control improve. In all, it's a vaguely comparable haul to the three southpaws that the Reds obtained for Johnny Cueto earlier this week in terms of the mix between near-ready and longshot prospects; McDaniel is one who likes the Tigers' take-home slightly better, and even more so if Norris can iron out a delivery issue that's hampering his command. With Price gone and the deadline less than 24 hours away, the Tigers aren't done dealing, given the aforementioned pending free agents. Likewise, the Blue Jays may still be in search of another starter. On Wednesday morning, before word of Price's availability circulated, Fox Sports' Ken Rosenthal reported that the Jays were said to be looking at the Reds' Mike Leake and other starters "at similar talent levels," in search of the best bargain; the Padres' Tyson Ross has been another name connected to them. Whether or not they do swing another deal, one can't knock the Blue Jays for standing pat given not only this week's additions of marquee talents Price and Tulowitzki but also the winter acquisitions of Josh Donaldson and Russell Martin—merely two of the best players at their positions for the past few seasons—via trade and free agency, respectively. With two months of the season still to play, their chances at ending that drought seem higher than ever.